I wanted to get our official spoiler thread going here, please see the thread HERE for speculation discussion. Please add any official information as it comes here! This is 39 in total, 1 die short. Also the card count is 142, indicating likely 4 more zombies. Edit: 2 more dice added. I have Hobgoblin in place of Jack o'Lantern. Iron Fist for sure is out. RDW only promo. 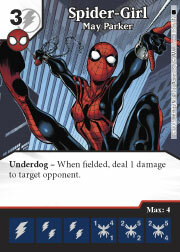 Still not 100% sure, but it drops right into the release numbering for spoiled cards. 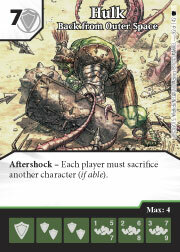 Aftershock, Man would love some more information about aftershock keyword. 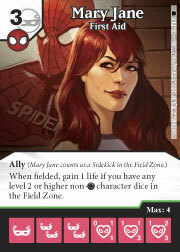 And if the Spidey affiliation is Spider-Men, or some other variation of Spidey Friends. 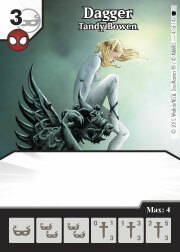 Four Zombies I have are - Carnage, Green Goblin, Kingpin, and Sandman. We know for sure Green Goblin Rotting Goblin was spoiled in GTM, along with "Spideys Greatest Villains"
Based on the way Hulk and Sandman are both worded Aftershock is probably "when this character deals combat damage do thing in clean up step"
There was a later, updated version. The difference is no Jack O'Lantern and no Iron Fist, but yes to Blade, Electro (was in the article, I missed it) and Hobgoblin. 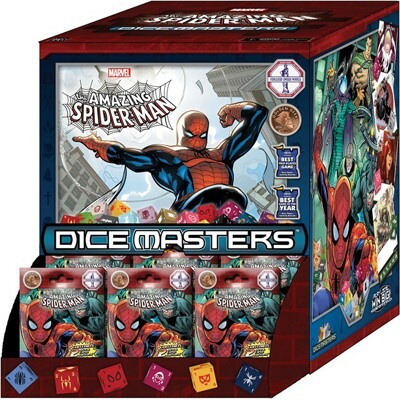 The list of characters was based on the background image here: http://wizkids.com/dicemasters/marve...ng-spider-man/ (the page is not linked yet but the address was easy enough to guess). 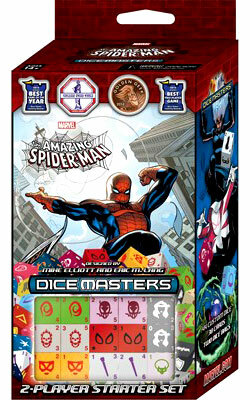 Since we have a lot of clues from the articles and dice images and there is additional information with the dice face images being somewhat in alphabetical order in the image we can be sure that this was the character list at some point of development (the same way we learned that Fantasticar and Invisible Woman where planned for the UXM set). Last edited by nutki; 09-29-2015 at 10:30 AM. SO.... I've been looking at that last zombie die, and I honestly think it might be a Morpheus. IIRC the vampires were integral to the Zombie story arc, and that it has pointed ears and what looks like long hair. 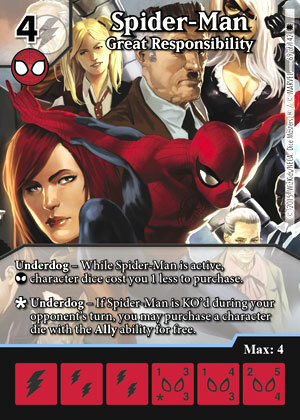 Perusing Spidey's Rogues Gallery, Morpheus seems like the most likely candidate. This could be a zombie version, or just a one of character, but either way he' have fangs, pointy ears and long hair. 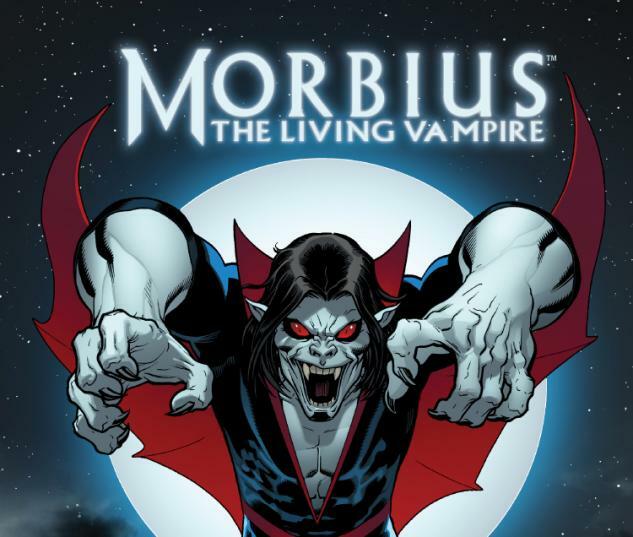 Morbius is pretty important to the whole Marvel Zombies thing, the anti-zombie serum was actually made from his blood. 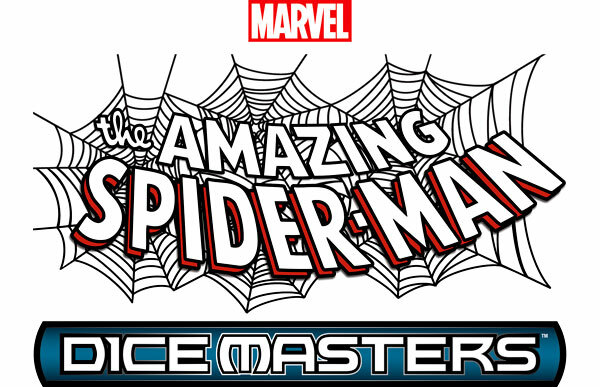 He also has a lot of history with Spider-Man. 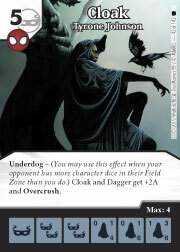 I kinda hope it is, but mostly because I'd like to see Midnight Sons be in Dice Masters some day. It does feel like every Marvel comic game inevitably has a Midnight Sons or Marvel Knights set eventually. I'd be down for either. I will update the list. Electro? Sorry, didn't see the updated character list. I was kind of hoping that pumpkin icon was pumpkin bombs. It has stats - character not action. It's possible we will get an action with stats someday. I'd be open to this as a progression in the game. A weapon that equips and gives different defense/offense boosts based on the stats, or costs more to field etc. It gives them more balance design space. That being said I think this is a character not an action. Just saw this image on facebook. Did we learn any new or interesting states. 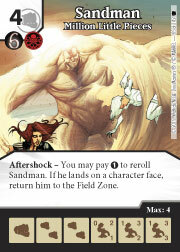 Ice-man is a defensive character has at least one side the same as his UXM counter part at 1/3/6 is it his level 2 side again? Dagger Mysteriou and Aunt May all with a 0 fielding cost side. 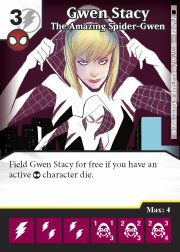 I don't even see a Mysterio die in the bucket, but Blink has a 0 cost side. 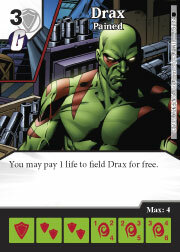 Drax is only a 4/6 at most? I want him to hit harderrrrrrrrrr. 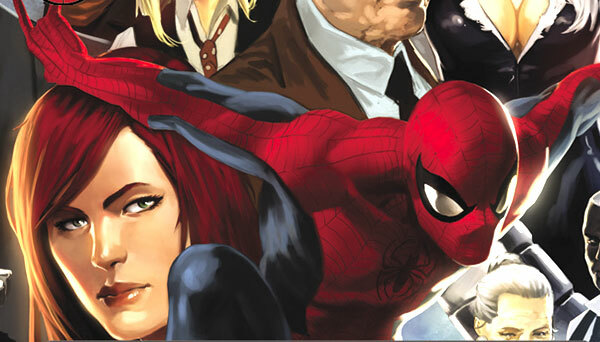 I'm seeing him under Venom on the right hand side but I may be blind.